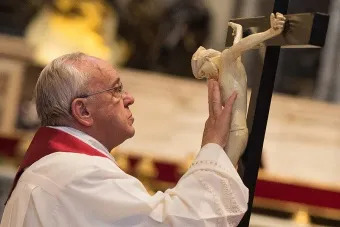 Vatican City, May 16, 2017 / 01:28 pm (CNA/EWTN News).- Only God can give true peace amid tribulations, Pope Francis said in his May 16 homily at his Casa Santa Marta residence in the Vatican. The Pope said it is not possible to obtain peace amid tribulation though human effort. 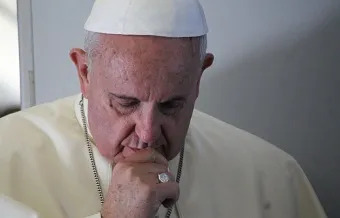 Vatican City, Oct 13, 2017 / 06:33 am (CNA/EWTN News).- With more than 30 deaths caused by the various wildfires devouring swaths of California, Pope Francis on Friday sent a message voicing his solidarity with victims, and ensuring his prayer for all those affected by the blazes. “Informed of the tragic loss of life and the destruction of property caused by the wildfire in California, the Holy Father assures you of his heartfelt solidarity and his prayers for all those affected by this disaster,” read an Oct. 13 letter signed by Vatican Secretary of State Cardinal Pietro Parolin. The letter also offered encouragement to civil authorities and emergency personnel working to put put the fires and help victims of the “tragedy,” and extended his blessing. The 17 different wildfires raging in northern California, made worse by dry conditions and unrelenting winds, have so far scorched at least 100,000 acres and have killed at least 31 people since the beginning of the week. Thousands more have been displaced, their homes and businesses destroyed. According to the Los Angeles Times, an estimated 2,834 homes were destroyed in the city of Santa Rosa alone, one of the hardest hit by the fires, while roughly 400,000 square feet of commercial spaces have also been reduced to ash. Much of the area of the Diocese of Santa Rosa has been under mandatory evacuation, including the chancery and the local Catholic Charities office. Vasa also thanked the firefighters and police, both those from California and throughout the country who have offered their help.